"Visualise the sensor and location data on your system"
The product presented here is called Grand. 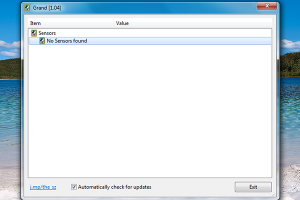 It’s a freeware application that will enable you to see sensor and location data on modern Windows operating systems. For instance, Windows sensor values such as the locator provider’s data will be shown and as this is an event-driven application, when a change occurred the displayed information will be automatically updated. Grand is a very basic application with a simple graphical application window displaying the sensors found enabling you to see the information. Elsewhere on Winportal we presented the freeware application called Geosense which provides accurate geographical location data without GPS hardware which can be used if you’re on a Windows 7 system and on Windows 8 operating systems the GPS information is based on your IP address, and via the Windows Location Provider you can start using the Weather app from the Windows store.